There have been a lot of sightings throughout the state of Say blister beetles. Blister beetles are ant-like with soft wing covers. The Say blister beetle, Lytta sayi, is green with orange and black legs and is about ¾ inch long. These blister beetles have been conspicuously feeding, sometimes in large groups, on a variety of flowers, including lupine, iris, false indigo and prairie indigo (Baptisia), lilac and mountain ash. They have also been known to feed on rose, daylily, and peony. Close up of Say blister beetle. All blister beetles secrete a defensive oil called cantharidin which can be very irritating and even raise blisters when skin is exposed to it. Fortunately, Say blister beetles generally do not possess a sufficient concentration of this substance to cause very severe problems to people. If Say blister beetles are in your garden, there are several options for their management. First consider whether the damage can be tolerated; if it can then just ignore them. 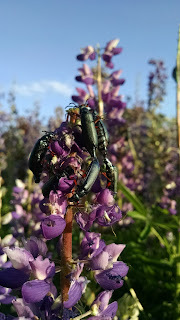 Also consider that Say blister beetles do not feed much past June so the closer to the end of the month it is, the closer the beetles are to being finished with their feeding. If you want to take some action against these beetles, consider physical removal. You can shake the plants and knock the beetles into a container of soapy of water. If there is concern about exposure to cantharidin and blisters, wear gloves to be on the safe side. Of course, physical removal may not be practical in all gardens. If you are interested in a low impact insecticide, try neem oil. Spinosad is also a low impact product. While it has little effect on most beneficial insects, it is toxic to bees. However this toxicity is greatly reduced once the material is dry. If using spinosad, treat foliage when bees are not active, giving it time to dry before bees are active again. You can also apply pyrethrins; to be effective this insecticide has to directly contact the insects. There is also no residual and it may need to be reapplied. There are a variety of residual garden insecticides that can kill blister beetles, such as permethrin, bifenthrin, lambda cyhalothrin, and carbaryl. Take care when using these insecticides as they are toxic to pollinators. Do not treat plants when pollinators are active around them. Instead, treat plants during late evening or nighttime when pollinators are no longer active to minimize exposure to insecticides.